The Duke Lemur Center, in Durham, N.C., has 250 lemurs representing more than 15 species, the largest and most diverse collection outside Madagascar. Imagine strolling through a pristine forest, leaves gently fluttering in the breeze, birds chirping in the trees, when out of a thicket comes a family of ruffed lemurs, casually strolling across your path on the way to forage for food. Stop in a clearing and you may notice a group of curious, bright-eyed ring-tailed lemurs quietly trailing you. 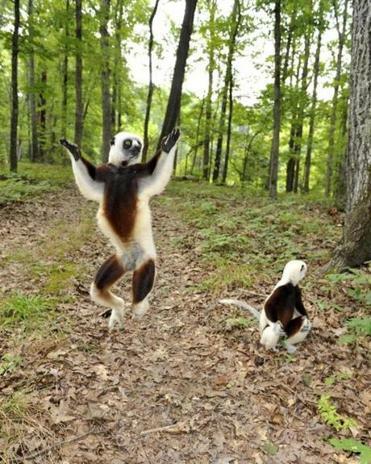 Look up and you might see a Coquerel’s sifaka lemur dangling upside down or leaping vertically from limb to limb in the canopy of trees above, squeaking and chattering. Sounds like an exotic rainforest trek in Madagascar, right? Nope, it’s a walk through the internationally-renowned Duke Lemur Center, in Durham, N.C., which has the world’s largest and most diverse collection of lemurs outside Madagascar. These extraordinarily adorable creatures who sing and dance and sail through the tree tops are the planet’s most endangered mammals. They also represent humankind’s oldest known relatives. The most ancient of primates, lemurs are prosimians, the primates that began to evolve before monkeys and apes, and as such they provide a crucial link to our understanding of evolution and biodiversity. Lemurs date back 62 million years, when scientists believe a small group survived a 260-mile sea voyage from the southeast coast of Africa, rafting atop a clump of vegetation and twigs, to settle on the isolated island of Madagascar. The island was one of the last places on earth to be settled by humans, roughly 2,000 years ago. With no humans or natural predators there for 60 million years, lemurs thrived and evolved into more than 80 species of varying shapes, sizes, colorations, and behavioral patterns. Now extinct on the African continent, lemurs live naturally only on this single tiny island. If you’ve seen the hit IMAX movie “Island of Lemurs: Madagascar 3D,” you may know the lemur’s native habitat is perilously jeopardized by encroaching civilization. More than 90 percent of the lemur’s natural habitat has been cleared, mostly by slash-and-burn methods for agriculture; out-of-control fires are the biggest threat to all wildlife on the island. Already, 17 species of lemurs have become extinct in the process. This makes the groundbreaking conservation, education, and research done at the Duke Lemur Center vital for the species’ continued survival. Founded in 1966 as a living laboratory for intensive, noninvasive study, the center has roughly 250 lemurs representing more than 15 distinct species living on 70 acres of preserved forest. The center houses two other groups of living prosimians as well, bushbabies (galagos) from Africa and lorises from Asia. Remember the PBS Kids’ show “Zoboomafoo”? The headliner himself lives in peaceful retirement at the center, and many of his offspring are there as well. The center also maintains a research and conservation presence in Madagascar, working with the Malagasy to help create sustainable agriculture while protecting the island’s natural habitat. Unlike a typical zoo, you have to schedule a tour in order to visit the Duke Lemur Center, but you would want to take advantage of the vast store of information guides can offer anyway. Tours tend to book up two to three weeks in advance, even more quickly during the summer months, so plan ahead — and bring your camera. Up close, lemurs are handsome, charming creatures with lively intensity and remarkable agility. From May through September, one of the most popular tours is the hourlong “Walking with Lemurs,” during which visitors are led by a guide and a member of the center’s animal care team into the lemur’s forested Natural Habitat Enclosures. Though the lemurs live in cages during the winter and often at night (called in from the woods by special whistles or other musical signals at feeding time) most have the opportunity during warm-weather days to range freely through acres of lush forest. During the tour, you can often get surprisingly close to these creatures, observing how they would live in the wild, foraging, playing, grooming, vocalizing. However, while they are curious and relatively unbothered by human presence, they are not domesticated, and are respectfully treated as wild creatures and never handled unless absolutely necessary. For families with young children or seniors who might have trouble with a woodland trail, the 60-90 minute “Lemur Live!” tour takes visitors of all ages down an ADA accessible path among outdoor enclosures housing a variety of lemur species. Along the way, guides highlight the differences and commonalities among the different primates, providing bits of history, science, and anecdotes to enrich your appreciation of the animals. During the cold-weather months in which the lemurs don’t range freely, the center offers a “Behind the Scenes” tour that offers visitors a glimpse into the facility’s inner workings and day-to-day lemur activities usually reserved only for staff. On each tour, visitors can expect to see up to eight different lemur species. Every tour also includes a visit to the nocturnal building, where visitors can see some of the more unusual, rarely spotted lemurs, such as the tiny mouse lemur and the elusive aye-aye, the world’s largest, and some say strangest, nocturnal primate. Its odd appearance — huge ears, continuously growing incisors, and a long, skeletal-like middle finger used to locate and remove insect larvae — has caused it to be viewed by some Malagasy villagers as an evil omen that must be killed on sight. The “Learning with Lemurs” program affords those with a keen interest in primates the opportunity to participate in a training and research session. Participants assist in animal care and learn how the center uses positive reinforcement to teach the animals behaviors that allow humans to care for them. With “Lemur Keeper for a Day,” you can go one further, trailing one of the caretakers and assisting in all aspects of daily care. One of the center’s more recent interactive offerings is “Painting with Lemurs,” which highlights some of the enrichment activities the center provides its denizens. Turns out, lemurs love to paint. You can choose up to three colors of non-toxic paint, then watch as the lemurs make a masterpiece in front of your eyes. When they’re finished, you get to take the canvas home with you. Twice a year, “A Photographer’s Dream” lets you create the art yourself on a trek through the habitat enclosures with resident staff photographer David Haring, who helps you set up the perfect shot of natural lemur behaviors, such as foraging, climbing, and grooming. And if you come out of your visit to the center really inspired, the “adopt a lemur” program lets you contribute to the future of the species by sponsoring your very own lemur or loris — just don’t expect to take one home with you.